I tried twenty times to get to the gems on the ledge in Artisans and Spyro keeps bumping into the wall and falling ;__; whywhywhywhy. You've got to get to the exact top of that little hill to get those gems. It's not too tricky once you get the hang of it (but if you've been playing RR/GtG or YotD a lot lately, it takes a little bit to remember that you can't hover). One thing to note is that in Spyro 1, you jump higher if you just jump holding the button. I always get used to Charge-jumping in Spyro 2 and 3 since it's just as effective as regular jumping; But in Spyro 1, Charge-jumping actually makes your jump much less. Try jumping while walking, not charging, toward the closest part of the ledge. When I was a kid, I liked the fact that this game didn't have the hover, because I could never time it correctly anyway, and I thought it made it a lot easier, but in actual fact, the platforming in this game later on seems to get slightly more tricky than in 2 & 3. That's just how I feel about it. Nowadays, I can master the hover easily, and it doesn't really bother me that there is no hover in Spyro 1, I always remember that it's not there. 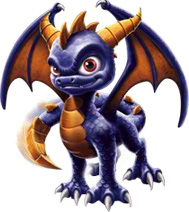 I think I'm reminded of that because Spyro controls so differently compared to the sequels. I like hover later on in the games, don't get me wrong (especially in GtG when you could combine it with the double jump glitch and get anywhere lol) but at the same time I almost prefer it without the hover! Not only does it make it a little more difficult imo, but it gave you levels like Tree Tops, basically all of the levels in the Dream Weavers' world, and Terrace Village where you had to learn to be pretty precise with your jumping, to a point where it was almost like a puzzle to just figure out where to go and how to get there! It was lots of fun I think. I still liked the hover addition later, but it changed the gameplay a lot! I'm surprised that Goonro didn't have to buy the ability to hover from Moneybags. This game, I just got recently so, yeah, no hover is so mean. I keep on pressing the button to try and stay up for a couple more seconds, but instead, Spyro just drops, I've even had to use the 99 lives cheat because that (well I think) up in wizard peaks. Strangely enough, I can get pretty used to how Spyro controls in the first game, probably because I've played it so many times, and so I'm able to judge how Spyro moves maybe? I'm not sure. At the end of a glide, you could try charging, that usually gives Spyro and extra boost similar to the Spyro 2 double jump.